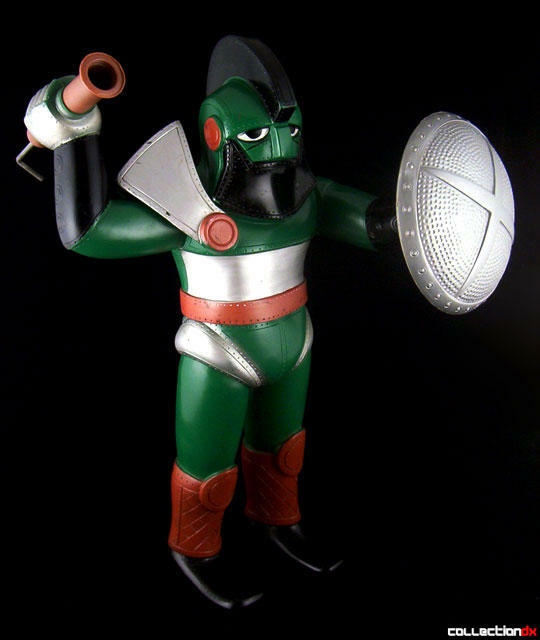 Spartan K5 (スパルタンK5) appeared in episode 14 of Mazinger Z and appeared in Jumbo Machinder form in 1973 as part of Popy's second wave of Machinder villains. 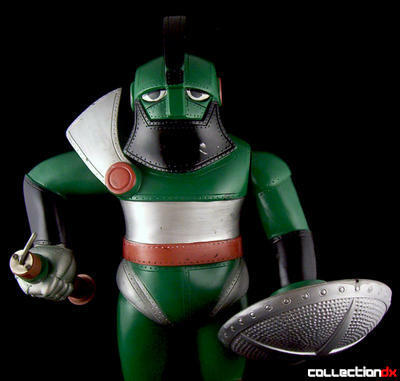 Other second series Machinder villains included Rokuron Q9, Green Ghost C3, and Garada K7 from Mazinger Z and Taihou Buffalo and Lenzari from Kamen Rider V3. All 6 characters were on the front of the box, which they all shared. 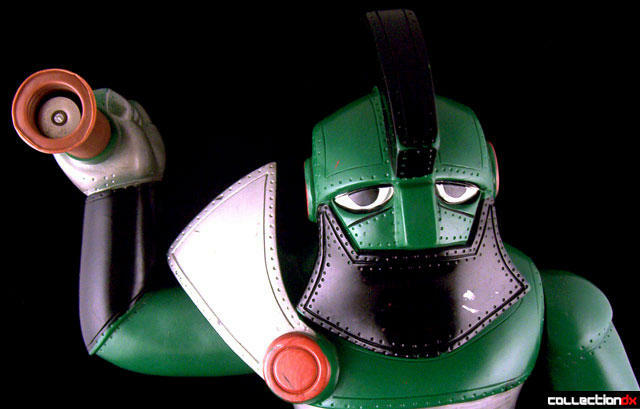 Collectors stand divided in their opinions of Spartan K5. 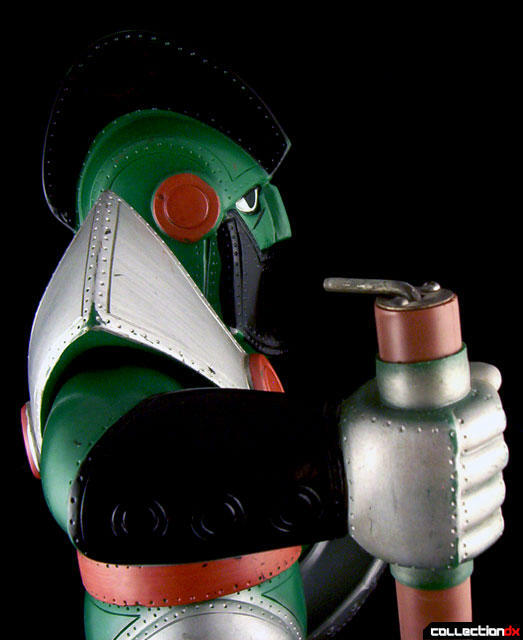 It stands out from other jumbos, even other villains, due to the fact that the right arm is permanently bent at the elbow to be ready to throw his spear. Also, he has no left hand behind that shield. And since it is really the only jumbo you'll find with a beard, it's understandable to hear that some think it's a silly toy. Personally, I've always longed for this piece. Something about the eyes, the way they look so cartoonish, has always struck a chord with me. Furthermore, when I started collecting, getting Jumbo villains seemed like a unreachable goal. At the time, they were just too rare. But Spartan was considered one of the easiest to get. So not only did I like the character, but I felt he'd be my best chance to get a villain. I missed out on a couple of specimens early and in hindsight, I'm really glad I did. It would not be long before I realized that I just had to have one complete with the spear. To me it makes a huge difference in the appearance of the toy. I think it looks a bit odd with his hand raised in position, but with nothing to throw. The problem is that getting Spartan with his spear is infinitely more difficult than finding one without it. It would take nearly 6 years before I would finally acquire the piece complete (albeit without a box). And in case you're wondering, yes, Spartan CAN actually launch that spear through the air. 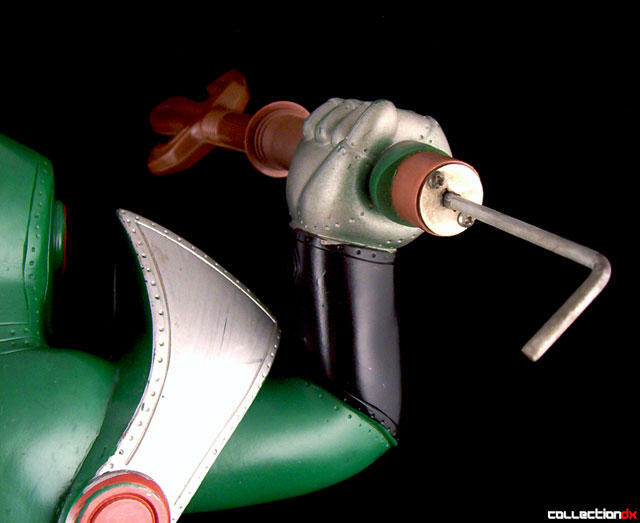 It features a simple metal rod and spring mechanism very much like the one in the chest of Green Ghost C3. Pull the rod back, twist it to hold in place and load the spear before twisting the rod again to release the spring. 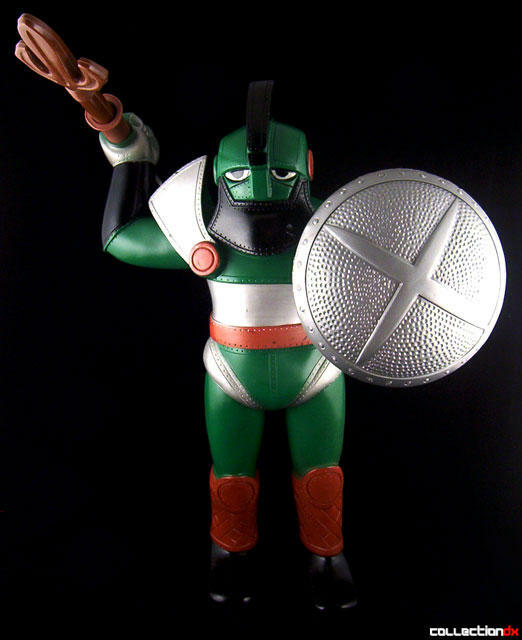 Spartan K5 is approximately 19" tall and the body is made out of green soft vinyl with painted details. Some areas are noticeably hand painted, like the eyes and waist. The spear and shield are made of polyethylene. You can position both arms and legs and in fact, many collectors do not realize that the right arm can be lowered. It is almost always seen in a raised position and that shoulder joint his hidden by the armor. 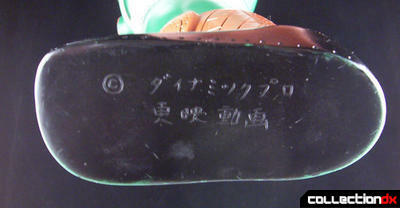 Like the other Jumbo villains, Spartan K5 has his name as well as copyright information etched into the bottom of his feet. 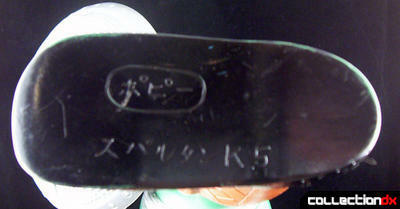 The left foot says "Popy" and "Spartan K5" while the right says "Dynamic Pro" and "Toei Animation". 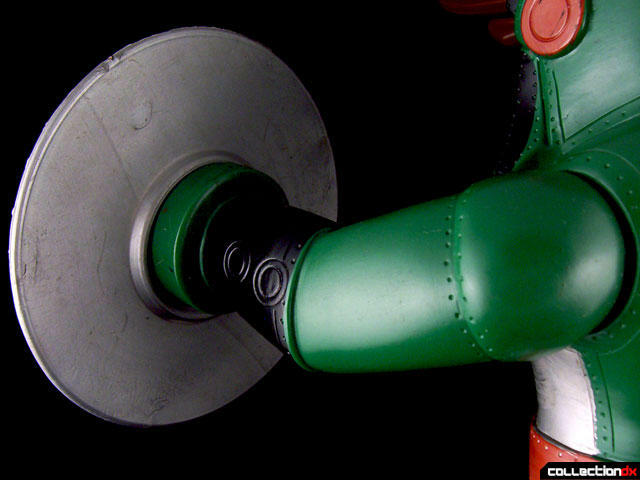 There's not much else to say about this toy. Like most jumbos, vinyls or vinyl jumbos, it's a simple toy that doesn't do much and whether or not you like it depends mostly on your own personal aesthetic tastes. I will say this though, if you want one and see one with a spear, I suggest you act because it might be a long wait before you see another. Spartan K5, along with the legendary and impossibly rare Garada K7, appears in this Mazinger Z Jumbo Machinder commercial!